Picasso has depicted a world on a scale so intimate you can hold an entire artistic vision on your finger. London, United Kingdom: A tiny portrait which Pablo Picasso set into a ring to appease his lover Dora Maar after an argument will go under the hammer at Sotheby's London auction house next week. The piece of jewellery was created by the great Spanish artist after he berated Maar for convincing him to trade an artwork for a ruby ring, prompting her to throw it into the River Seine. 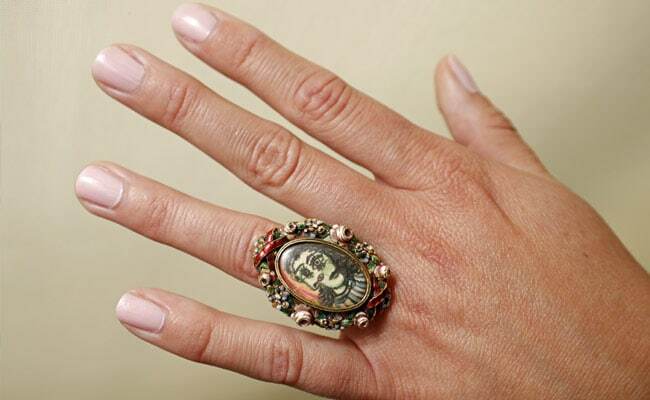 While Maar later searched unsuccessfully for the discarded ring, Picasso went to work on creating a replacement with a miniature portrait of his muse which he set into a ring encircled with flowers. "Picasso has depicted a world on a scale so intimate you can hold an entire artistic vision on your finger," said Thomas Bompard of Sotheby's London. Despite their relationship breaking down, Maar kept the ring until her death in 1997. It is expected to fetch up to &#163;500,000 ($630,000, 565,000 euros) when it is auctioned on June 21. French artist Maar was influential in Picasso's life as he responded to the Spanish Civil War, most famously with his "Guernica" mural following the bombing of the town. In his "Femme en pleurs" portrait, of a weeping woman following the devastating bombing raids, Picasso depicts a distraught Maar. His muse became "the tragic embodiment of human suffering, her highly strung temperament fitting her for this role", as Picasso depicted war-torn Europe, according to a recent exhibition of Picasso's work at London's National Portrait Gallery. Picasso continued seeing other lovers during his relationship with Maar and the pair separated in 1946. Last month one of Picasso's portraits of Maar, "Femme assise, robe bleue", sold for $45 million at Christie's in New York. Back in 2006 his "Dora Maar au chat" portrait fetched $95.21 million at Sotheby's in New York.